Summarizing these numbers is a bit tricky, especially with the newer schedules. Different brand vaccines can require different numbers of doses and more or fewer vaccines may be recommended to different populations who are considered high risk for various reasons. The lower numbers in any given range summary here represent general population recommendations. These are shown in yellow on the 2018 schedule with the following description from the CDC, "Range of recommended ages for all children". 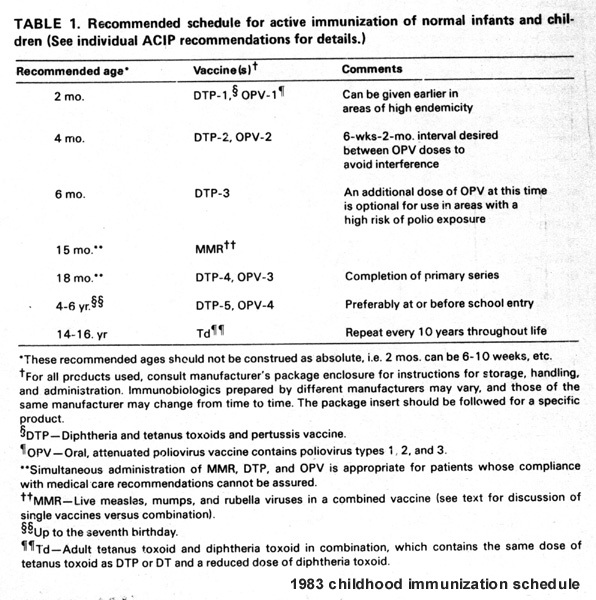 If you count each injection as one vaccine even though several (DTap, MMR, TDAP, DTP) contain multiple antigens, the number you'd arrive at for total doses by 18 years of age is 11 in 1983 and 54 in 2018, not counting those recommended for special situations. Using this method, if you count the vaccines recommended during pregnancy (Influenza and TDaP on the conservative end) the total number of vaccine doses a child is exposed to by 18 rises to 56.